Frogster has today opened the beta sign up for its upcoming action-MMORPG TERA. 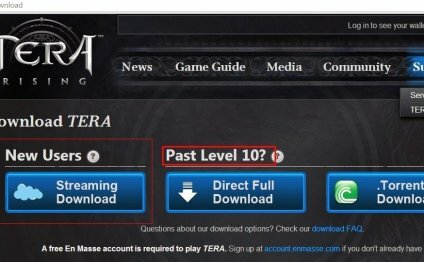 Those who register on the official website will go into the running to enter the European closed beta, which Frogster will be providing more information on in the upcoming weeks as TERA gears up for launch. Players who register by 13thJanuary at 11:30 CET will be entered into a draw to win one of the first 1, 000 closed beta passes, giving them access to the hugely anticipated MMO over the entire duration of testing. Those who aren’t lucky will still be in with a chance to jump into the world of TERA as more invites follow shortly after. TERA is set to launch in spring 2012, and will be a highlight for MMO fans in 2012. TERA is set to change the genre forever with its action combat system, which players use to actively target their enemies in battle. Powered by the Unreal Engine 3, the game is set in a breathtaking world where players join a shaky alliance of races to ward off a rising Argon threat. TERA‘s impressive, highly detailed virtual world of triple-A quality awaits thousands of players. Completely developed using Unreal Engine 3, TERA broadly surpasses other current MMORPG titles with breathtaking 3D environments, thrilling graphics, and spectacular effects. The seamless architecture of the game world, including open dungeons and massive cities, guarantees a smooth and fluent gaming experience without the interruption and frustration of long loading times. TERA offers a vast range of character customization possibilities with six races and eight character classes to choose from. TERA‘s dynamic real-time combat system engages players in battle considerably more actively than conventional MMORPGs. In the massive fantasy world of TERA, success in dodging and blocking enemy attacks is not solely determined by statistics as it is in rival titles. Rather, using the mouse and keyboard or a game controller, players actively control their character‟s movements. Thanks to sensitive collision detection, online adventurers in group combat actively keep their opponents at bay, for example using sword and shield. Teamwork is essential as players try to save their fragile home from the horrors that threaten its very existence. TERA is set to be released in 2011 and will be based on a subscription model.